Hershel W. Williams is a retired United States Marine Corps warrant officer and United States Department of Veterans Affairs veterans service representative who received the United States military's highest decoration for valor—the Medal of Honor—for heroism above and beyond the call of duty during the Battle of Iwo Jima in World War II. He and three soldiers are the only living Medal of Honor recipients from that war. In addition, he is the only surviving Marine to have received the Medal of Honor during the Second World War, and is the only surviving Medal of Honor recipient from the Pacific theater of the war. 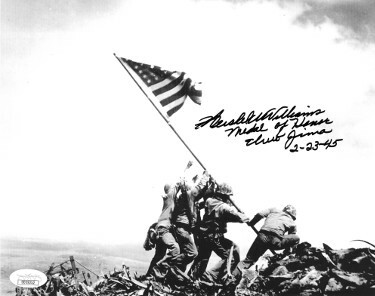 Hershel W. Williams has hand signed this 8x10 Photo with Medal of Honor Iwo Jima Feb 23, 1945 inscription. JSA Hologram #DD39252 and Certificate of Authenticity.